Want to share your experience? Enter the Student Speaker Competition through March 2. 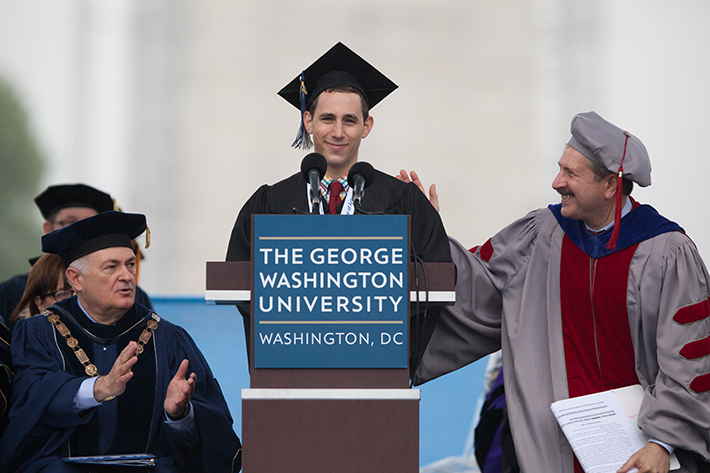 Commencement: it’s the day George Washington University students dream of, but each year only one student has the honor of delivering an address before an audience of thousands on the National Mall. Before the crowds and applause, the road to becoming GW Commencement student speaker begins with an idea and an audition. Graduating GW undergraduate and graduate students are encouraged to enter the 2015 Student Speaker Competition. Applications will be accepted through March 2. 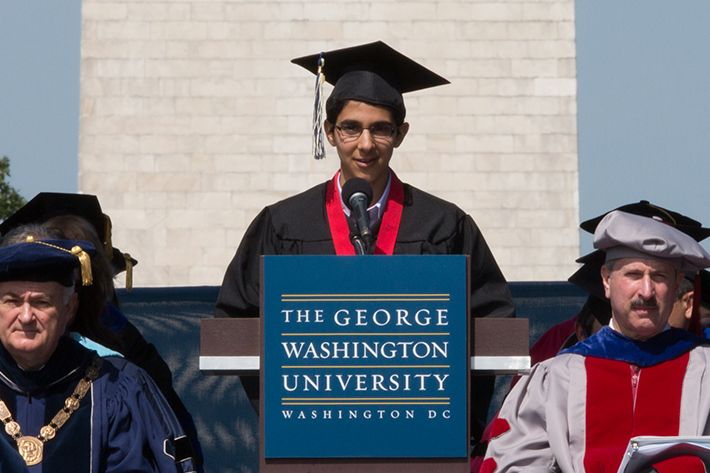 George Washington Today spoke with former student speakers Alex Zafran, B.A. ’13, and Noreen Kassam, B.A. ’12, about their unique Commencement experiences and their advice for future speakers. Mr. Zafran delivered a speech that focused on his passion for Latin. Looking back, what was the highlight of the experience? A: Have you ever looked out on a sea of 24,000 people? I certainly didn't until the moment I stepped up to that podium on Commencement day. All at once, it was inexplicably exhilarating, nerve-racking, empowering and humbling to be the center of attention. I took plenty of pauses in my speech not only for oratorical emphasis, but also to enjoy the moment. Q: What is your favorite part of your speech and what inspired it? A: People can only listen to deep thoughts on antiquated subjects—in the case of my speech, ancient Rome and Latin etymology—for so long. It’s exactly why I needed to throw in a joke and bring everyone back to reality. It was beyond flattering to have a crowd of 24,000 people laugh—at least I think they were laughing—at my joke. Q: What advice do you have for student speaker-hopefuls? A: I believe a speech that has to be delivered in five minutes should be derived from material that you could speak about off-the-cuff for at least 15 minutes. You'll know if you've chosen the right focus when you begin writing your speech and see midway through that you already have far more than 5 minutes' worth of text. Make this unique topic the theme of your speech as you attest to the beautiful, invaluable experiences that make a GW education second to none. Ms. Kassam urged her peers to pursue public service in her 2012 Commencement speech. Q: Looking back, what was the highlight of the experience? A: I can still remember the feeling I felt when Jim Core introduced me to the podium. Standing up there and looking out over the Mall at my family, classmates, the monuments— it was one of the most memorable moments of my life. A: The last line: "I hope you all do well, but more importantly I hope you do good." It's a simple message, and one I firmly believe in, live by and hope others do, too. It highlights the idea of service to others and to do good in the world. It's a subtle reminder to think a little deeper about what defines success as we move forward in our lives and try to do well and be "successful." It's important to remember to do “good” in the service of others. A: Go for it! Why not?